Browse: Home / 2017 / February / 21 / Another Climate Alarm Gets Silenced: Study Shows “Tiny Algae, Hugely Resilient”! What follows is a press release from the Alfred Wegener Institute in Bremerhaven, Germany. It turns out that microalgae — “an important source of food in the oceans” — are far more resilient to changes in ocean pH values than alarmists would like us to believe. Microalgae are microscopically small, single-celled algae species and an important source of food in the oceans. Dr Clara Hoppe of the Alfred Wegener Institute examines how changed living conditions as a result of climate change affect Arctic microalgae. Dr Clara Hoppe has always had a plan B in place for her Arctic expeditions. “Three years ago, when I started to work in the Arctic, everyone told me to think carefully about what I should do in case the Kongsfjorden area in Svalbard freezes over and I can’t leave with a small ship,” says Clara Hoppe. Many times she ran through the scenario of thick ice blocking the way into the fjord. But plan B never materialised. “So far, I have never experienced ice on the fjord. The water temperature was always above zero degrees Celsius,” the 32-year-old tells us. 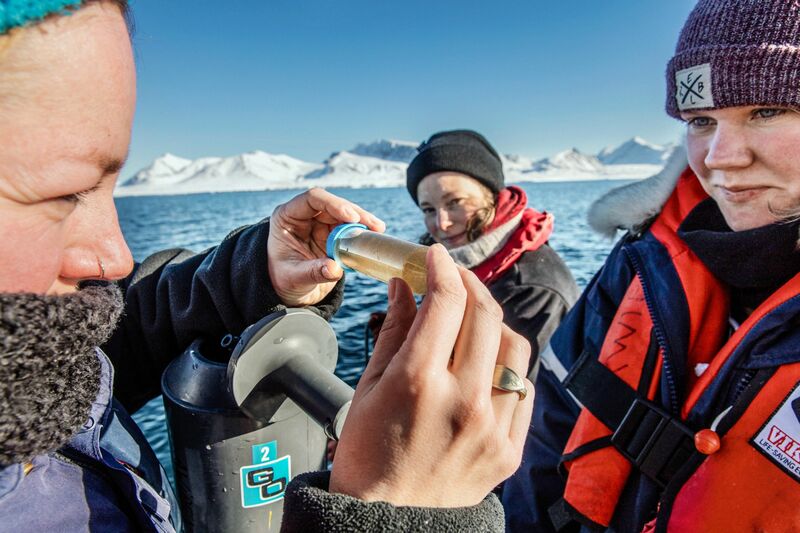 The factors that make Clara Hoppe’s job easier in practice, are also the subject of her research: She tries to understand how environmental conditions that are changing as a result of climate change, affect the microalgae of the Arctic Ocean. This includes the rise of the water temperature as well as the acidification of the oceans and changed light conditions in the water due to the decrease in sea ice. Unlike macroalgae, microalgae are not visible to the naked eye, they are microscopically small, single-celled algae species. They are so tiny that one millilitre of water can contain thousands of them. Because microalgae are an important source of food, such as for crustaceans like krill, a change in their growth, for example, could have far-reaching implications for the Arctic food web. A special feature about Clara Hoppe’s research: While traditional research on ocean acidification is often carried out in the laboratory, she and her team regularly take several hundred litres of water samples in the Arctic, which allows them to study a diverse community of several dozen algae species that are there at that time. “This greater diversity of species means that we can perform experiments to analyse, which of the many species benefit from climate change and which suffer from it. Also, the relationships between the species can be studied,” Clara Hoppe explains. Back in Bremerhaven, she, too, spends many hours in the lab. There she subjects the microalgae to different conditions: “For example, we raise the temperature or the carbon dioxide content of the water to observe how the different species from the Arctic respond to this.” One of the things Clara Hoppe analyses is how much biomass the algae create. Do they store more carbon when conditions change? Or more nitrogen? The latter makes the algae much more valuable as a food. The most important microalgae in the Arctic are diatoms. They create a hard skeleton out of silica to protect themselves from predators. What happens when the water gets warmer or contains more carbon dioxide? If, for example, the diatoms build heavier skeletons, they would sink to the ground more quickly. This also includes the carbon they have fixed into biomass, which means that it would not be part of the global carbon cycle for many years. She already has a hypothesis: The microalgae respond differently to environmental changes such as temperature rises. Even within a species, not every microalgae deals with it in the same way. It seems that this flexibility makes the species community as a whole more robust. The greater the diversity within a species, the better the microalgae are able to soften the effects of environmental changes. Over time, in a community of algae, the individuals who best adjust to the respective conditions represent a greater percentage of a population and thus make up for the “deficits” of the others. And that could be why the productivity of the algae community can stay the same in the long term. That’s as far as her hypothesis goes. In practice, Clara Hoppe will continue to go out into the Kongsfjorden to find answers to her questions – but she worries less and less about having to execute plan B. The best explanation for her results probably is that the environmental conditions in the study area have not varied outside of the historical records. Their evolution would have tuned their tolerances to temperature, pH and other factors. I wouldn’t abandon Plan B – be safe, the climate is always changing. Her results are just as important as anything else that might have been found. Well done! I would think that samples for comparison could be taken from different latitudes and sections of warm and cold currents to help establish what we used to call the “ecological amplitude” for various diatoms etc. Their evolution would have tuned their tolerances to temperature, pH and other factors. By ” evolution” do you mean upward, increasing in genetic information? Do you know of any actual means whereby living entities can increase the information in their genome? Take the expression a + b = x. With a and b known, we can increase the information content only by substituting for x the correct value. This can be done with an algorithm as we have learned in the primary school. Because the number of values for x is infinite, the probability that a random number generator would give the expression more information content is zero. I would guess that in the biological example an algorithm can do the job. Jeez, the woman is a genius. Who would have thought such an outlandish thing? Perhaps the report has a list of “other species” and “other regions” along with what was reacted to and what the reaction was. If not, then she just made that up. That’s the very worst and wrongest description of genetic drift I’ve ever come across. A series of diatom species calling the other species together to say “I am just going outside and may be gone for some time”. Or just possibly that modern climate changes haven’t been anything special or unusual at all? It would be interesting to see what the water flows are when these bleaching events happen. No flow means no food for the little critters that live in corals. Coral without critters is mostly white. No food, they either starve, or go on a holiday to find food. you are wrong. Did you just make a decision based on your general dislike of heterogeneity?